Planning your wedding is one of the most exciting things you’ll ever do. It can also be one of the most nerve-wracking. The to-do list can grow like a magic beanstalk. While selecting your officiant is only one of many tasks, please remember that your ceremony is the heart of your wedding. With that in mind, let me share some information about how I approach my work as an officiant and how that work is reflected in my fees. My approach to your ceremony — Couples who come to me are best described as spiritual,not religious. If that applies to you, you want a unique experience, a truly personal ceremony that celebrates your love and honors the commitment of marriage without any religious affiliation. You are my ideal couple! I cater to the unchurched. What if you do want a religious feel to your ceremony? Some couples want a ceremony that includes religious elements to affirm their own beliefs. Some feel that including religious elements will make their parents and grandparents more comfortable with a ceremony not being held in a church or synagogue. In my experience, the older generation doesn’t get upset because the younger generation doesn’t share the same beliefs or follow the same spiritual path. The older generation simply wants to know that their ways are respected by the younger generation, that the legacy is valued. In a new wedding ritual, a guest presents the couple with illumination, the gift from the hickory tree. Finding ways to honor that legacy is my job. One of the ways I do that is by incorporating cultural elements into the ceremony. For example, one of my couples was a Catholic groom and a Jewish bride. They were being married under a chuppah. The bride’s mom wanted to be sure the groom’s family would be comfortable. In my welcoming remarks, I spoke about the canopy’s ancient connection to the four Royal Stars of Persia, their connection to the four elements, their evolution into the four archangels, and the point in a Catholic Mass when the priest swings a censer filled with incense to the four directions. We stand on common ground. We share the same sky. Absolutely. The world is changing. Your principles by which you live your life might come from science or philosophy or ethics or nature or the simple desire to make the world a better place. The path you’ve forged for yourself should not be subject to judgment. That's the philosophy behind my approach to officiating: I cater to the unchurched. I am a proud ally for marriage equality. I believe that love is love. Red socks in honor of Michael's mom who didn't live long enough to see her son lovingly, legally married. Next is a face-to-face meeting, whether in person or via FaceTime or Skype. You want to be comfortable with the person who will shape your ceremony. 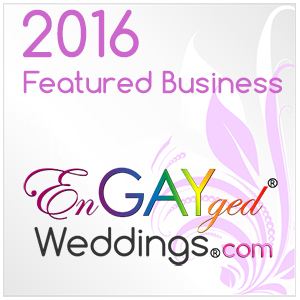 You want an officiant who will respect your views and listen eagerly to your suggestions. You want to be able to laugh with your officiant. I want those same things. The vibration between us needs to be relaxed. I want to feel comfortable picking up the phone or sending a quick, informal email or text. So, that first meeting is important. I look for a location that’s convenient for all of us; usually, that’s a Panera. At the meeting, I ask a lot of questions. Your answers become the inspiration for the rituals I'll suggest for your ceremony. If what you want is a unity candle or sand ceremony, that’s what I’ll do. But I can offer you so much more — a ritual involving butterfly blessings, the magical properties of garden herbs, Tibetan prayer flags, the secret language of shells,the power of keys, or a modern adaptation of an ancient Celtic handfasting – the origin of the phrase “tie the knot.” The possibilities are endless. My goal is to create a ceremony that truly reflects who you are as a Couple and why you fell in love. I use a simple, plain language letter of agreement. It sets out the details of time, place, fee, etc. Not all couples want the same kind of ceremony. To reflect those differences, I've created four pricing levels. An elopement refers to a brief, simple ceremony performed on a weekday usually at a town hall or court house. Traditional Ceremony at $950: This includes meeting to discuss the ceremony with one or more personalized rituals, a rehearsal (depending on my schedule), cue sheets for vendors, multiple drafts of the ceremony script, and as many meetings or phone calls as needed to be sure you’re comfortable with the ceremony. Traditional Ceremony at $1250: This level includes everything in the Full Ceremony plus a modern, humorous version of a the ritual that inspired the phrase “tie the knot.” I make each cord by hand. Each one is approximately 9 feet long, allowing plenty of space to tie additional knots for each anniversary and for the birth of children. You can see samples on Etsy.com/shop/MoonRiverRituals. the ritual “Gifts from the Trees” and includes cross sections of wood from seven trees, along with a one-of-a-kind pair of stone “Wedding Wisdom Owls” hand-painted by fine artist Carol Chaput. You can see samples of the owls on Etsy.com/shop/MoonRiverRituals. Every couple should have a wedding budget. How you allocate those funds depends on how you prioritize the elements of your wedding day. Once we've agreed to work together, I email you a questionnaire. The answers become the building blocks for your love story, a key component of your ceremony. As a romance writer, I can say with certainty—I do know love stories. About six to eight weeks before the wedding, I email you the first draft of the ceremony. From that point on, we go through as many drafts as needed to ensure the ceremony is what you want. You have full approval of the script. No surprises. Early. On the day of the ceremony, I show up early anywhere from an hour to ninety minutes or more. I get the license from and set up any items I’ve brought for the ceremony. I coordinate the ceremony logistics with other vendors, as needed. If you’ve chosen to include a handfasting ritual, I want to be sure your photographer and videographer know what to expect and will be positioned in just the right place to see that knot form! It's your responsibility to obtain the license. In Connecticut, you must obtain the license from the town in which the ceremony will take place. The license is my legal permission slip to perform the ceremony so I'll need to get it from you before the ceremony begins. That's one of the reasons I arrive early. Filing the license is my responsibility. As soon as the ceremony is over, I sign the license. Within two business days I mail the license to the office of the town clerk who issued the license. If your ceremony is on a weekday, I usually file the license at the town hall immediately following the ceremony. Of course! You can include personal vows in addition to traditional vows, or instead of traditional vows. Do we have to include readings? Not at all. If you do include a reading, the words should mean something to you. I have an extensive library and a circle of friends who are poets. If you want a reading, I’d be happy to help you find something appropriate. The ceremonies I create usually run between 25-30 minutes. No boring moments! The grounds of the Fox Hill Inn make a beautiful setting for a wedding photo. In addition to being an ordained, nondenominational minister, I'm also a certified Life-Cycle Celebrant trained in the history and structure of ritual by the Celebrant Foundation and Institute, a nonprofit educational organization. As a Celebrant, I work with couples who describe themselves as secular, religious, spiritual, pagan, nondenominational, atheist, humanist, a couple seeking to blend their cultures, a couple seeking to blend their religious traditions. You might fall into one of those categories, or maybe you simply want to express yourselves your own way. Don’t all officiants operate the same way? • Is trained in the structure of ritual. You don’t want the energy of your ceremony to fizzle or to peak at the wrong time! With all these factors to consider, there are also the intangible qualities. Do you feel comfortable with this officiant? Does he or she respect you? Your spiritual choices? Your sexual orientation and gender expression? When it comes time to buy a home, have a baby, blend families, begin a new business venture, retire, renew your vows, or say good-bye to a loved one, can you picture this officiant standing with you, shaping a ceremony to honor these milestones? To explore what I can do for you, please send an email to Zita@MoonRiverRituals.com or call me at 860-402-4231. Just a friendly conversation. No obligation.